Needham Town Hall is located at 1471 Highland Avenue, Needham, MA 02492; phone: 781-455-7500. Photo: James Smith House, ca. 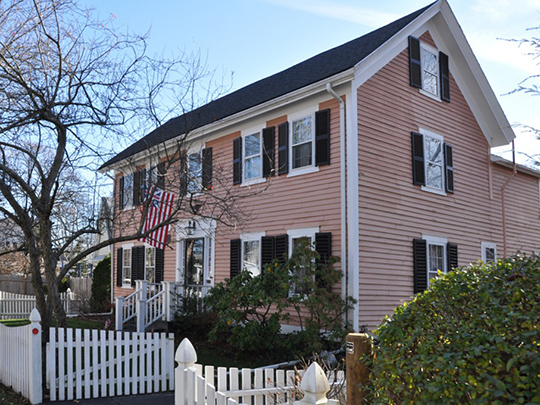 1730, 706 Great Plain Avenue, Needham, MA. Listed on the National Register of Historic Places in 1986. Photographed by user:Magicpiano (own work), 2011, [cc-by-3.0 (creativecommons.org/licenses/by/3.0)], via Wikimedia Commons, accessed February, 2014. Needham was settled ca. 1680-1694 and incorporated in 1711. On April 16, 1680, the Dedham Company of Watertown purchased a large tract of land from an Indian, part of which, with some of Dedham, was incorporated as Needham. Between 1714 and 1780 the town was active in road building and bridge building; before 1720 a few saw mills and corn mills were operated, but farming was the chief occupation. The town is now a residential suburb of Boston. Louis A. Cook, editor, History of Norfolk County Massachusetts, 1622-1918, Volume I, S. J. Clarke Publishing Company, New York, 1918.